Wilde Geese are large, strong-willed birds that we see flying in large flocks across the grey winter skies. We hear their distinctive, raucous honking calls as they migrate home each year, their constant return symbolizing loyalty and the rhythms of nature. 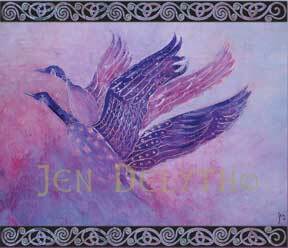 The early Celtic Christians adopted the Wild Goose as their symbol for the Holy Spirit, rather than the calm, cooing Dove of surrender. These independant birds represent the people who choose to worship in their own way, close to the myth-haunted lands of the rugged western places of Britain and Ireland, far from the wealth and decadent power centers of religion and politics. Although Wild Geese cannot easily be tamed or caught, a young gosling attaches to the first large moving object it sees when born, and will even think a human its mother. This profound mystical connection between man/woman and the Goose developed into of the earliest husbandry practices, before the domestication of animals in Neolithic times. Once adapted to the human community, the independent Goose is an adept scavenger, needing little care, and is a useful food source of meat, eggs, fat and feathers. We see Goose patterns on early pottery and bone carvings, and few birds are so important in ritual and symbolism as the Goose.